The Presidency on Wednesday gave reasons why President Muhammadu Buhari did not seek support for the All Progressives Congress candidates during the party’s rally held in Owerri, Imo State, on Tuesday. It said the President addressed a mixed crowd of voters across political parties, who were united in endorsing his re-election, despite having their local candidates for other positions. The Senior Special Assistant to the President on Media and Publicity, Mr Garba Shehu, while speaking to journalists, explained that in such a mixed crowd, the President could not speak of support for the APC candidates alone but must talk about all the parties. Shehu noted that this did not mean that the President did not want the APC candidates to win elections in Imo State, saying that Buhari was solidly behind his party’s candidates. “The massive crowd that gathered to welcome President Buhari in Imo State was made up of not only supporters of the APC in the state, but also supporters of other parties who are united by their love for the President and their desire to see him re-elected, despite the local candidates they support,” Shehu told reporters. 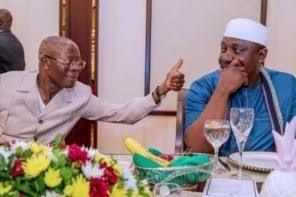 The Presidency added that in the circumstances he found himself in Imo, the President could only advise the people who turned out to receive him to vote according to their conscience. “While President Buhari is fully behind the APC, he welcomes endorsements from those who do not belong to the ruling party but is also sensitive to their support for non-APC candidates at the local level. “It would have been insensitive of him to offend his non-APC supporters by ignoring their local affiliations,” Shehu stated. 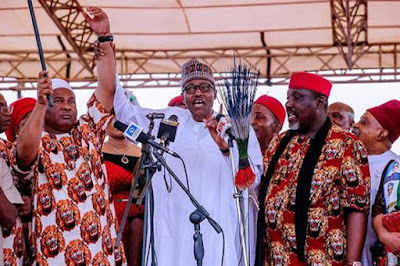 He said by raising the hand of Senator Hope Uzodinma, the APC governorship candidate in Imo State, at the rally, Buhari had shown where his preference was and this did not call for a debate. Recall that while addressing the rally, Buhari did not mince word in urging the crowd to “vote for candidates of your choice across parties” to the chagrin of the APC members. The people reacted by cheering and clapping for the President. Governor Rochas Okorocha, who does not support Uzodinma’s governorship bid, joined in the cheering. When the APC National Chairman, Adams Oshiomhole, realised the President’s error, he was seen trying to whisper to Buhari to make a correction. The President then responded by telling the crowd again to vote for the APC candidates. There is a big crack in the Imo APC, threatening its electoral fortunes next month. While Okorocha wanted his son in-law, Uche Nwosu, to be the APC governorship candidate, the National Working Committee of the party endorsed the primaries conducted by the Uzodinma faction. In December 2018, Nwosu, with the support of Okorocha, defected to the Action Alliance and became the party’s governorship candidate. However, both the Okorocha group and the Uzodinma faction said they would vote for Buhari on February 16.